So one of the things I have had an interest in doing lately is making cheese - however it always seemed like it would be a long, intensive labour involved process (which seems ironic considering the types of food I make and how long I am usually in the kitchen cooking...) but when cheese is so readily available if often seemed at odds to make my own. However, then I saw the recipe for paneer in the cookbook and it listed two simple ingredients - I was hooked. The recipe is amazingly easy and quick. I will admit that the only problem I had was figuring out when the milk was boiling. I waited and made sure that I was consistently stirring the milk to make sure that it didn't burn. I wasn't sure of what to expect when I added the lemon juice but it instantly starting to part ways and form these solid parts. The big thing that I learned from this was cheesecloth - despite it's name and use in this type of application was probably not the best. 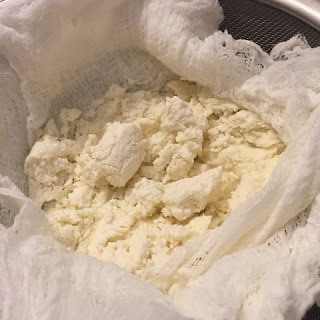 Maybe it was because I was using cheep cheese cloth but I really had to make lots of layers to be able get a good covering on the cheese so I could squeeze out the liquid. Next time I would probably use Muslim (fabric) instead. I did set the cheese wrapped in the cloth in a strainer over a metal bowl and then place my mortar and pestle on top. I eventually used the Paneer for a simple Chili Paneer dish which was fantastic - the next this to do with paneer is make paneer stuffed naan bread. Put the milk in a saucepan and bring it to a boil, stirring frequently so that it doesn't stick to the bottom. When it starts to boil, turn the heat down. Add the lemon juice and stir until it curdles. You'll see the curds separate from the whey and form lumps, at which point turn the heat off. Line a colander with a few layers of cheesecloth and put it in the sink. Pour the cheese curds through it slowly, draining off all the liquid into the sink. Fill the saucepan with wonder and pour it over the curds again to easy any lemon juice off. Grab the corners of the cheese cloth and squeeze the water out by twisting the top of the cloth until it's tight around the pall of paneer. Keeping it twisted, put a weight on top of it press it and leave the colander in the sink or set over a bowl so that any remaining water can drain out. Leave for 3 hours or so, until firm to the touch, and refrigerate until you're ready to use it. If stored tightly wrapped in plastic wrap or in an airtight container, the paneer will keep for 3 to 4 days.